Topics of the Day, this Norman Rockwell painting, appeared on the cover of The Literary Digest published September 20, 1919. The alternate title for this work is Audience Applauding. This painting was Rockwell's tenth picture featured on the cover of The Literary Digest. The Digest, for the record, featured Rockwell's artwork on its cover a total of eight times just in 1919 alone. 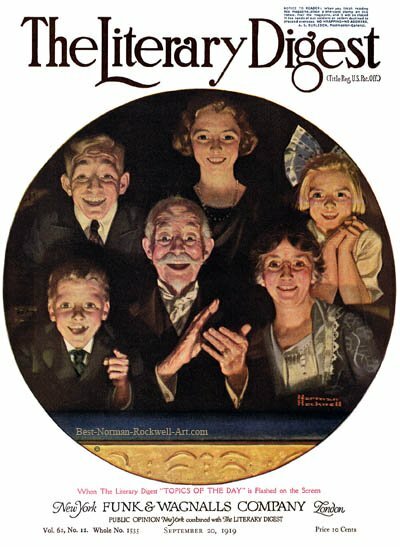 Beginning in 1918 with the first cover, Boy Showing Off Badges to the last, The Night Before Christmas in 1923, The Literary Digest featured Norman Rockwell artwork on its cover a total of forty-seven times. This painting also appears on page 50 of Norman Rockwell, A Definitive Catalogue by Laurie Norton Moffatt. The Literary Digest also used this illustration again on December 20, 1919 in an interior advertsiement promoting the Literary Digest. The original oil on canvas painting, 30 x 30 inches or 76 x 76 cm, is part of a private collection. This painting is reminiscent of another earlier Norman Rockwell cover from The Saturday Evening Post, People in a Theatre Balcony. The full title on the cover of the magazine was When The Literary Digest 'Topics of the Day' is Flashed on the Screen. The painting was named that by the editors of The Literary Digest. Thankfully, the title has been shortened over the years. The Literary Digest was published weekly. By 1919, it had been in print for over 30 years. One of its favorite weekly departments was the "Topics of the Day" feature. Keep in mind that the moving pictures of the day were usually fifteen minutes long at most. The filmed "Topics of the Day" were probably shown between movie features or as a preview. Topics of the Day was only one of 47 Norman Rockwell Literary Digest covers; here is the list of more Norman Rockwell Literary Digest scans. After World War I ended, Rockwell went back to painting scenes from everyday life. In this painting, Rockwell gives us a glimpse of a family at the movies. Grandpa, Grandma, Mom, Dad, Brother and Sister are all here enjoying a night out. They are sitting in the balcony, judging by the railing in front of them.